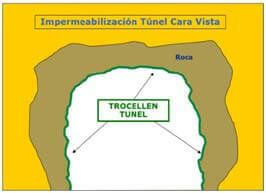 According to the current legislations and requirements in the tunnel waterproofing covering the outside of the tunnel, materials that provide a high classification of reaction to fire and high mechanical characteristics are required, as well as the proper functions of guiding-channeling the tunnel water leaks from the vault to the gable end. 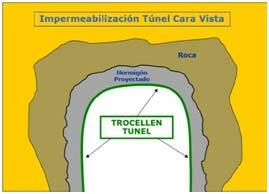 TROCELLEN TUNEL CLASIFICADO FUEGO is a composite and lightweight plastic sheet that meets these requirements and functions with a product that offers the highest classification that a plastic material can obtain in the fire reaction test according to EN 13501-1. Technical reinforcing fabric that provides the sheet with a high resistance to breakage and a good tear behavior to the nail. Polyethylene film, which facilitates the work of installation favoring the sticking / heat welding of the overlaps between sheets.